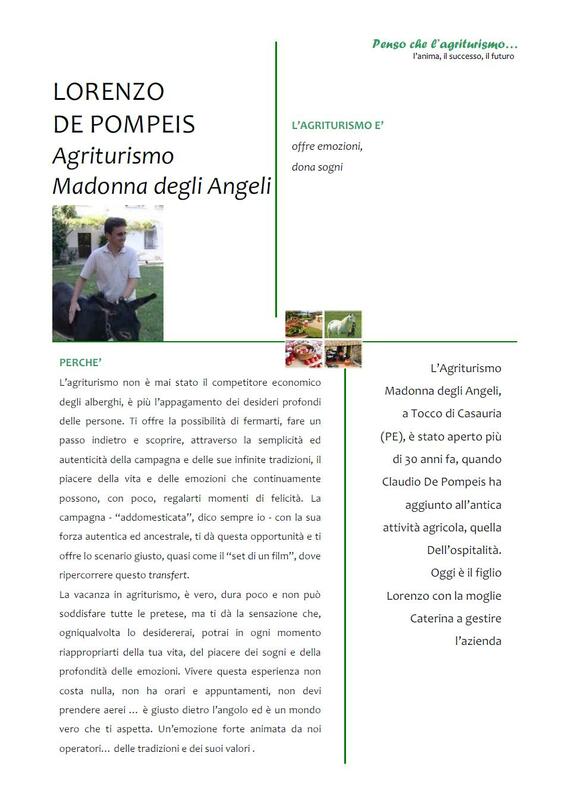 After some research online guides to Italian farmstays … the choice fell on this farm, “Madonna degli Angeli ” of Giammorretti – de Pompeis family. Phone and answers a lady, very friendly, who gives me all the particulars and information it needs. Find out later that the lady is the wife of Lorenzo, the host of our stay. … and if you decide to go out there, please, give yourselves a glass of walnut liqueur (made by the mother of Lorenzo), really good! … proven oil and red wine, very good ! So you can take beautiful walks in nature simply staying inside the farm, walking among chickens, horses, three cats and two wonderful and sweet dogs, Max – an ‘Abruzzo shepherd’ – and Maja, a female ‘German shepherd’, that will be in the morning to see you soon as you open your door for the first daily pampering! Many thanks for our holiday in Abruzzo. We had a great time. We really loved the Abruzzo region. Thank you for your advice about what to see and visit. We hope to visit again and do some more trekking when our baby is old enough! “We were warmly welcomed by a friendly and knowledgeable Lorenzo, who piled us with literature of the region. He straightaway recommended the best restaurants, and where to go for the best of local architecture and nature viewing. We had only a short stay but the experience was wonderful! Also as a Chinese family from Singapore, we were touched by the warmth of the Italians in Abruzzo.I would highly recommend this Farm Stay. couple of weeks later they booked 5 days, and stayed at your loveley place. Stefan Bohl & Mona married 6month later in a tiny village in tuscany. the daily life is going on – it is raining and raining, we are working and often thinking of the nice time in Abruzzo. Very often we enjoy your fantastic olive oil and the marvellous wine. Thank you for your message: we are back in London and it was not easy to leave Italy on Friday ! We really enjoyed our whole trip in your nice country and spent a very good time in your place. We booked this property for just a stop over for 3 nights. But it was just wonderful. We travelled with our dogs and they really loved the atmospher and especially the resident goat. Lorenzo the owner was really helpful. Vin, huile d’olives, balades en moto (avant le vin bien sur) tout était formidable. Merveilleuse région, la montagne, la mer, des paysages magnifiques !!! nous comptons bien revenir et nous venons de loin (1600 kms!). how are you? I hope very well. How are the donkey and the kitten?? I saw the donkey on your website. Are the girl your children? I am ok, just dealing with the normal daily routine. Our holidays were wonderful and I still sometime think of it. Here in Germany it is cold and the weather and the felling is autumn-like. It is dark in the moring when I go to work and in the evening when I come home. It is unbelievable that it was only 3 weeks ago when we were staying at your nice place. Nous sommes bien rentrés après 24H de route et surtout 5 h de bouchons en suisse (tunnel et Luzern). Encore merci pour vos légumes, les tomates sont délicieuses, accompagnées de l’huile d’olive et du vin , génial. Nous avons beaucoup apprécié notre séjour chez vous et la région est magnifique. Agosto 2012: Madonna degli Angeli, dove l’anima ed il corpo riposa in un ambiente caldo e piacevole, tranquillo e disteso. Grazie tutto questo a Lorenzo e Caterina ed alla loro passione di “fare turismo” made in Italy. Un sincero ringraziamento da Franco con Adry e Paolo con Monica. Ein Traum von Italien! Wir waren im Sommer 2014 für 2 Woche hier und fanden es genau das, was wir gesucht hatten. Es ist ein reizendes kleines Landgut, mit genug Platz für alle und netten anderen Gästen. Lorenzo und seine Familie haben sich sehr gut um uns gekümmert, und unsere kleine Tochter war ganz begeistert von seinen beiden netten Töchtern. Die Aussicht vom Pool ist einfach traumhaft. Der Kanal, der neben dem Gut fließt, ist mit einem hohem Zaun gesichert, so dass man keine Bedenken mit kleinen Kindern haben muss. In der Umgebung kann man nett wandern, für unsere 3-Jährige war es nur manchmal ein bisschen steil. In Fußweite des Guts ist ein einfaches Restaurant, das ok. war. 5 Minuten mit dem Auto eines mit super Küche, da waren wir gleich 3 Mal. Mille grazie a Lorenzo e familia! Thank you so much for all your help and advice, we continue to look for a suitable house in Abruzzo. The Agriturismo was the perfect place to come back to after a day house hunting. We slept like logs it was so peacefull and we were so lucky with the weather. Again thank you to you, your wife and the girls for the eggs. we just had the most wonderful vacation at your farmhouse! We stayed at the special small apartment: Torretta for 6 nights, which is very charming and really contains all you need for a wonderful stay. At our departure Caterina asked me if there was anything we were missing or they could improve at the apartment, but we couldn’t think of anything, it really got everything we needed. Since we’re used to work many hours at home we especially enjoyed sleeping in a little bit in the mornings, which was – despite the really hot weather (38° Celsius most of the time) – no problem, thanks to the curtains and air condition in the bedroom, to then start the day with freshly made Mocca and a good breakfast on the patio. Lorenzo and Caterina had plenty of ideas of places for us to visit, things to see and do that suited us. So we experienced the perfect combination of relaxing, sunbathing and being in the pool – and being out on a hike for example to visit the hermitages of San Bartolomeo, the Blockhaus and the Grotte del Cavallone. During the same time there were quite a few other families at the farmhouse, but we almost didn’t notice them, there is really enough space for everyone! The atmosphere was fantastic! Lorenzo and Caterina are the most wonderful hosts that one could wish for! We totally fell in love with your heavenly farmhouse! We will definitely be back for another vacation some day and we will highly recommend you to our friends and family! Wir haben eine Woche lang Urlaub im “Turm” von Madonna Degli Angeli gemacht. Es war zauberhaft, charmant und hatte wirklich alles was wir benötigten für einen wunderbaren Urlaub. Bei unserer Abreise hat Caterina gefragt ob wir irgendetwas vermisst haben oder ob es etwas gäbe was sie noch verbessern könnten, aber uns fiel beim besten Willen nichts ein, es war wirklich alles vorhandne was wir brauchten. Da wir zuhause sehr viel arbeiten (mind. 6 Tage jede Woche) haben wir es sehr genossen in der Früh ein bisschen auszuschlafen – was trotz des wirklich sehr heißen Wetters (meistens hatte es 38° Celsius), aber dank der Klimaanlage und der Vorhänge kein Problem war, um dann mit einem frisch gebrühten Mocca und einem guten Frühstück auf der kleinen Terrasse in den Tag zu starten. Zur selben Zeit wie wir waren auch einige andere Familien zu Besuch, von denen wir aber so gut wie nichts mitbekommen haben, da das Gelände wirklich groß genug ist! Die Atmosphäre war einfach fantastisch! Lorenzo und Caterina sind die wundervollsten Gastgeber die man sich nur wünschen kann! Wir haben uns verliebt in diesen paradiesischen Ort der Idylle und werden definitiv wieder kommen und können dieses Urlaubsdomizil nur jedem wärmstens empfehlen! Thank you again for everything! See you soon! Best wishes from Bavaria, Germany! We stayed at this farmhouse recently (April 17 through April 22) and cannot say enough about the wonderful time we had! The rooms were spacious and comfortable, as was the beds (both queen size). The surrounding area is so beautiful, with the Gran Sasso mountains all around. During our stay, the mountains still had snow on top and were magical. Lorenzo and his wife, Katarina, could not have been more gracious, helpful and kind to the three of us. All of our questions and needs were answered. They both spoke English well, I only wish that the three of us visitors could speak Italian as well. During our stay, I befriended the mule who came to the car on our last day as we were leaving to poke his head inside of our car and nuzzle up against me. I was so touched. We were sad to leave this beautiful bed and breakfast, but would stay here again if we come back to this Abruzzo area. Auf einer großen Italienreise waren wir im Juni 2018 im Agriturismo Madonna degli Angeli. Zentral gelegen zwischen den großen Nationalparks Italiens und inmitten uralter Kulturlandschaft bietet die Region eine Vielzahl von kulturellen Sehenswürdigkeiten, Gelegenheiten zu Aktivurlaub und kulinarischen Highlights. Auch die Adria ist nicht weit entfernt, so dass man durchaus einen Tag am Strand, ergänzt durch Sightseeing und Restaurantbesuch verbringen kann. Entscheidend für die großartigen Tage war die Planung unseres Aufenthaltes durch Lorenzo, den überaus sympathischen und hilfsbereiten Eigentümer. Nachdem wir ihm unsere allgemeinen Vorstellungen von einem gelungenen Urlaub geschildert hatten, stellte er uns mit seinen fundierten Kenntnissen über die region Vorschläge für unsere Tagestouren zusammen, die besser nicht sein konnten. Selbst die regionalen Wetteraussichten berücksichtigte er. Wieder “zuhause” in unserem großzügigen, rustikalen Apartment oder am Swimmingpool ließen wir den Tag bei einem Glas Rotwein des Hauses Revue passieren. Wir denken mit Freude an diese Tage in Umbrien zurück. Sollten wir nochmal in die Abruzzen kommen können, wissen wir schon wohin uns die Reise führen wird.